The moon is full on November 4th in the sign of taurus and this moon has a strong connection to Neptune; Neptune brings the water element and a very strong connection to the unconscious mind and the depths of our spiritual being for it is a very spiritual planet. Draw down the light of Sirius in through your crown, filling up with this starlight and then radiate it out and around you. The presence of Neptune within the energies of this month’s full moon takes us back to the very ancient time of Lemuria which was a culture very much associated with the water. There is much history upon this planet way beyond any written history that we know of for we go back much further in time than is written in any books. There was an ancient land called Lemuria which is where the Pacific Ocean is now and it included the island of Hawaii. Due to rising water levels this land flooded and the inhabitants fled to different parts of the world and particularly to Egypt. The Lemurians were the keepers of much ancient knowledge and those that travelled to other lands carried the secret knowledge with them; much of that knowledge was kept hidden because in the new cultures which rose up there was not the higher level of consciousness which had existed in Lemuria and the secrets had to be guarded. This was a land not as many have portrayed filled with very advanced technology, it was not like that at all, it was a place of simple living but yet the people who inhabited there had a higher consciousness and so they lived a very positive and deeply spiritual existence. Let me take you back to that time and let me show you the role which you had as a priestess in that land and of how the role of women was so balanced and honoured and this is what we are trying to return to in this present time. In that culture women were respected because of their deep connection to their inner wisdom and their lunar self for the males knew how much power the women had. Even though since that time there have been dominant female societies most cultures have been male dominated and this is because somewhere within the ordinary consciousness is the knowledge of how much power women did indeed have in those ancient times and so it was continually suppressed thereafter. I will take you back for you to reclaim what you left there so that you may bring it back into the present with the full understanding of who you truly are. This is never the case of the female being any greater than the male it is a case of perfect balance with both acknowledging the power within each and equality but the time has come now where the female light must be re-established in harmony and equality as never before. Draw down the watery aspects of the light of his full moon as you fill up with not only the lunar energies but also the Neptunian vibrations. As you sit within this wonderful white light a very tall female also in white light will appear to you, she is a Lemurian for they were very tall beings. You recognise her energy and you know that you must go with her and she takes you back through the mists of time to the ancient land of Lemuria which is where the Pacific Ocean is now. When you arrive there are other priestesses waiting to greet you as they welcome you back to a place you have lived before. You will relive a life which you have spent there and you will learn over again how you worked with the moon and the female energies. The men in that culture knew that when the moon was full you were filled with such power and had such great abilities for healing and creation. Women are governed by the moon and their menstrual cycle in the natural state lasts 28 days like the cycle of the moon and they will menstruate and ovulate at either the full moon or the new moon. Most women menstruate at the new moon and this is known as the White moon cycle and those who menstruate at the full moon have a cycle which is known as the red moon cycle. Menstruation at the full moon is deeply spiritual for the women have greater access to the energy of spiritual creation, healing and manifestation rather than procreation. In Lemuria the women ovulated at the full moon for they knew how to harness their inner energies for the good of their community for healing and the fertility and the land. Be aware of this as you return back to your roots and as you spend time with your priestess sisters you will awaken to your deep connection to the lunar cycles and you will remember how you menstruated when the moon was full and you will stand within your own power as you never have before. You will experience those things which you were able to do in that life and you will see how you would always make a deeper connection to the moon when it was full and you would feel your inner energies and you would go and use them for the benefit of everyone. The creative force within you would be so abundant that you would walk in the fields and the crops would be fertilised. You could make plants sprout just by being close to them and fruit ripen upon the tree by the application of your light for you were a walking beacon of light and everything you touched came to life through your closeness. You will experience that life again and it will change you for you will finally understand what it means to hold the divine female energy within you and you will be given a greater understanding of why that light was suppressed in the ages to follow. You will return back from this journey awakened and it will be as though something within you has switched on. Remember that even if you are past childbearing age and even if you have had your womb removed you still have the spiritual energies within you of your womb and you are still deeply connected to the cycles of the moon. Some of you may even find that the rhythm of your cycle changes after this journey of remembering for it is one of the most powerful journeys you will make. Remember we are so powerful through our connection to the moon, in more ways than you have ever considered possible and by your recent connection to the ancient land of Lemuria you will now begin to remember. At this time of year the land is filled with spiders’ webs and the web is brought to you now for it is extremely magical; the web brings not only a connection with all things it also brings the weaving of dreams into your life. Let the weaver goddess come to you now and she will help you to spin a web of light and you will place that web across the Earth and bring a greater sense of unity and connection with all beings. 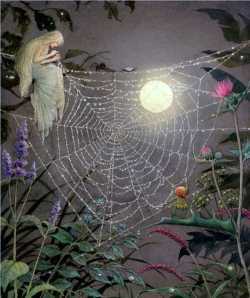 Sit within the web with her and she will bring you teachings of the sacredness of it for even though you understand its magic there is so much more which you have not seen yet so let her come and bring you the deepest teachings of it. Spiders webs are extremely healing and they have long been used to heal wounds and so we can understand that these beautiful formations can heal both body and mind for they contain the most magical properties. You now see before you the most beautiful wood and it is hung with spiders’ webs with the sun shining through them and creating rainbow lights on their shimmering threads, you feel as though you have entered wonderland to be a witness to so much beauty. You see that there is a hammock made of many webs and you go and lie down in it to be soothed by the softness and the gentle rocking motion of it. As you lie down you find you are encircled by beautiful elementals who seem to be made of gossamer light just like the spiders’ webs and they rock you like a baby in a cradle and they sing lullabies to you and as they do you are healed and soothed like never before. May this month’s full moon take you to the depths of your unconscious self to find and retrieve your true nature and true power as a great force of healing and creation.